Looks like Reliance is in the process of hiking its 3G rates, recently reliance slashed its 3G data by around 50% and was offering 1GB 3G at Rs 123 but we have been getting reports from our readers who are reliance customers stating they are getting SMS from Reliance informing about the hike. 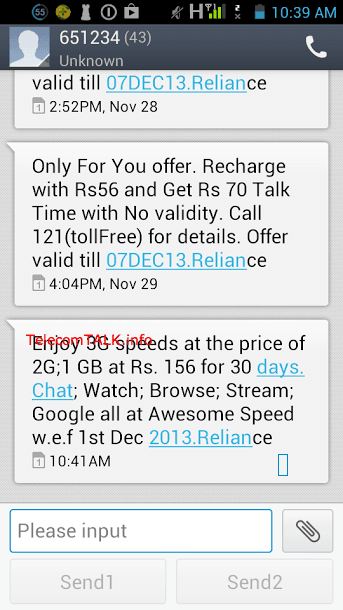 As per the recent SMS communication by Reliance to its customers the operator clearly cites about the hike which says “1GB 3G data will cost around Rs 156 with a validity of 30 Days with effective starting 1st december” . Now we will have to wait and watch if other operators will follow the same ? In ODISHA still it is Rs.123/- for 1GB data till now.